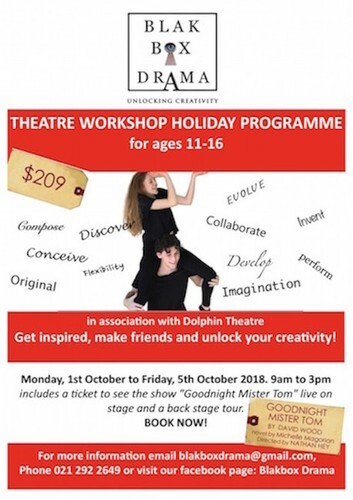 Blakbox Drama are running a week long Theatre Workshop Holiday Programme for 11-16 year olds in association with Dolphin Theatre, Onehunga. Get inspired, make friends and unlock your creativity! Only $209.00. Includes a ticket to see the New Zealand Premiere of "Goodnight Mister Tom" live on stage and a back stage tour. Book now to avoid disappointment. We will be taking inspiration from young lives in WWII to create a piece of unique youth theatre.